Losing a tooth is a distressing experience. No matter what has led to tooth loss, having gaps in your mouth can fracture your self-image and your confidence. When one missing tooth turns into several or even all your teeth missing, many areas of your life – including your diet, your ability to speak clearly, and your social life – can be negatively affected. Tooth replacement is always the best option – ask any dentist and they will tell you the same thing. The quicker you replace a tooth after it is lost, the better you protect your remaining teeth and your overall dental health. There are a number of ways to replace lost teeth – bridges, full or partial dentures. But there’s only one permanent way to do so, and that’s with dental implants. Simply Teeth in Essex has carried out numerous successful dental implant treatments, and believes that they are often the best solution to tooth loss because they are both permanent and the only way to replace missing tooth roots. The tooth roots are vital both in keeping the teeth in place and in ensuring the jaw bone stays healthy. In essence, dental implants are bionic tooth roots. 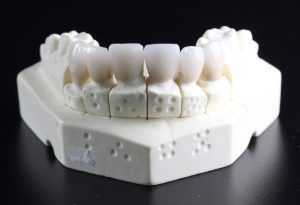 They are small screws or posts made out of titanium and precisely positioned to support the biting and chewing forces generated by false teeth. Depending on your clinical requirements, a dentist can combine either dentures, bridgework, or single crowns with dental implants to create a fully-functional, natural-looking smile. Dental implants are also designed to be a long-term solution to tooth loss, lasting for many years and sometimes for a whole lifetime. This requires prudent dental hygiene, because just like natural teeth those attached to implants can gather plaque and cause periodontal (gum) problems. In most cases a healing period of between three and six months is required after dental implants are placed. A process called osseointegration takes place during this time, which sees the titanium implants mesh with the bone and surrounding blood vessels. Temporary teeth are often fitted during this healing period so that patients are not left toothless. Your implant dentist will create you a full treatment plan so that you know exactly what’s involved.